On April 18, in a speech at the U.S. Holocaust Memorial Museum, President Bush correctly stated that Sudanese President Omer al Bashir’s “record has been to promise cooperation while finding new ways to subvert and obstruct the U.N.'s efforts to bring peace to his country.” The President continued, “The time for promises is over — President Bashir must act.” Today, one month later, the government of Sudan continues to obstruct the deployment of a stronger peacekeeping force, support the Janjaweed and other militia groups, and harass and intimidate humanitarian workers. The U.S. government officials tasked with determining how President Bashir’s National Congress Party (NCP) has responded to the Bush administration’s latest ultimatum have concluded that the threat of “Plan B” has not impacted Khartoum’s behavior. But why should it? The U.S. has issued so many hollow threats over the past three years that senior NCP officials will dismiss even a clear and direct warning from the President of the United States. President Bush must immediately end the dangerous state of impunity that fuels continued state sponsored violence in Darfur by punishing those same NCP officials. Using its current chairmanship of the UN Security Council, the U.S. should propose a new list of names for targeted sanctions, including asset freezes and travel bans. The administration’s current Plan B will impose sanctions on three individuals. However, the proposed targets do not include three of the people most responsible for what the administration terms genocide: Assistant to the President Nafie Ali Nafie; Director of National Intelligence Salah Abdallah Abu Digin (AKA Salah Gosh); and Minster of Defense Major General Abdel Rahim Mohamed Hussein. Salah Gosh and Abdel Rahim Mohamed Hussein have already been named by the UN Panel of Experts charged with investigating crimes against humanity in Darfur. The Panel found that both men had “command responsibility” for the atrocities committed by the multiple Sudanese security services. Hussein was found responsible for “coordination operations between entities within the Sudanese Armed Forces and militia groups” — code language for orchestrating Janjaweed attacks on civilians. The principal policymaker for Sudan’s national security and intelligence affairs, Nafie Ali Nafie continues to advocate a military solution in Darfur. His latest policy is to reward the Janjaweed for their crimes in Darfur by forcibly installing his Arab allies into positions of traditional power and resettling Arabs on non-Arab land, fundamentally altering the demography of Darfur and finalizing a policy of ethnic cleansing. If we know who is responsible, why is the Bush administration afraid to punish those responsible for what it calls genocide? 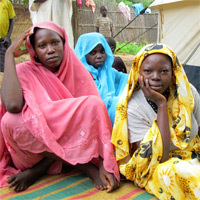 ENOUGH urges activists to dial 1-800-Genocide to connect directly to the White House, tell President Bush that the time for a Plan B with teeth is now, and demand that Nafie Ali Nafie, Salah Gosh, and Adbel Rahim Mohamed Hussein be punished for crimes against humanity in Darfur.